We got the Racer last week and took it for a couple of runs this weekend. You are right about the color and wheel covers; they turned out great. 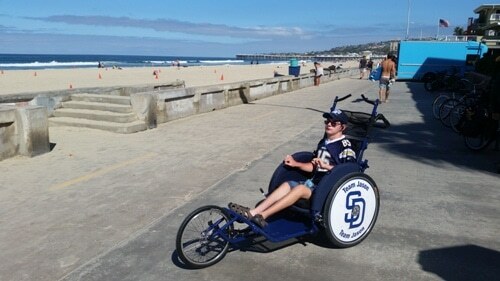 We got a ton of smiles and thumbs up along the boardwalk in Pacific Beach. PB is our favorite place to run; nice and flat, a big wide sidewalk, and lots of activity. Tell everyone at Adaptive Star thank you. You’re providing some amazing products that give us the freedom to get out and have a blast.